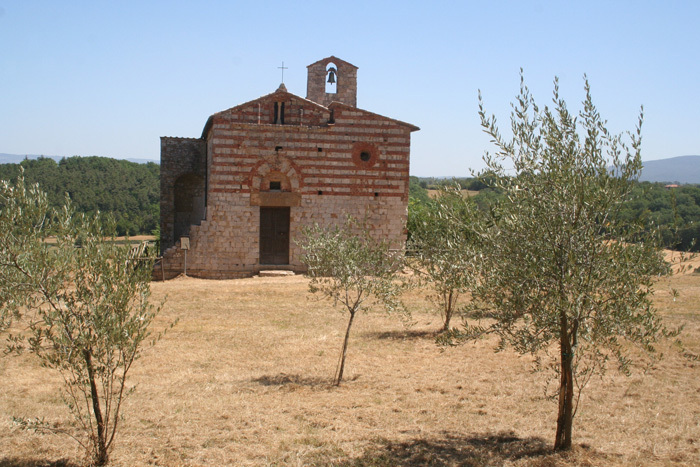 The presence of christian communities in this valley dates back to the 5th century, as many country churches, Pievi, were located along the old Roman roads and can be found throughout Tuscany, Umbria and Emilia - Romagna. The term pievi is thought to have come from the Latin plebs, denoting their function among the common people. These crudely built rural churches were built to spread Christianity into the pagan hinterlands of medieval Italy by providing a place where baptisms might be performed. These romanesque churches were built from the 7th to the 13th centuries and incorporate many interesting architectural features. The basic form of these pievi is rectangular, with 3 apses and two rows of columns from front to back. They are usually built on an east-west orientation with the facade facing west. Typically they are of rough hewn soft stone and adorned with an assortment of pagan images. 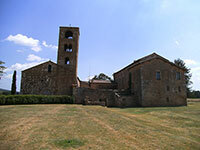 The Pieve di Santa Maria dello Spino between Monticchiello and Bagno Vignoni, and the Pieve dei Santi Vito e Modesto a Corsignano in Pienza are two of the most important little churches of the valley. Pienza was rebuilt from a village called Corsignano, which was the birthplace (1405) of Aeneas Silvius Piccolomini (Italian: Enea Silvio Piccolomini), a Renaissance humanist born into an exiled Sienese family, who later became Pope Pius II. Once he became Pope, Piccolomini had the entire village rebuilt as an ideal Renaissance town. Located less than 1 km from Pienza and reached by taking the romantic and scenic via del bacio (way of the kiss) is Pieve di Corsignano. Its origins can be traced to the VII century, while the actual version dates back to the 12th century. Inside is the baptismal font where Pio II and his nephew Pio III were baptized. The scenery of the Val d’Orcia begins with a symmetry of natural harmony with its rolling hills, and then changes into the majestic grandeur of the Amiata. Monticchiello, La Foce and San Quirico d'Orcia are situated within an hour's drive from Podere Santa Pia. The road which leads from Castiglioncello Bandini to Monticchiello and San Quirico, passing first through Castello Porrona, Montalcino and Pienza, is breathtaking. It already existed in 1050 and the place was a stoppimg post (mansium ad sextum) on the imperial road that connected the Cassia consular road with the Aurelia. The facade is constructed with sandstone blocks and a few disorganized friezes, pieces that had been recovered from a former structure; the roof has a double slope. The bass relief of a dragon and a human figure with an animal on a leash is divided by the only window. A light frame with an intertwining vegetable theme forms, with the roof, a kind of gable. There was probably in the past a roof over the front entrance of which you can see the remains. 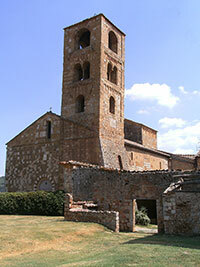 The bell tower was built before the actual church and was included during the enlargement in medieval times. On the right hand side the "scarpa" base is to be noticed because it is surmounted by a meridian, the elegance of the hanging arches and the good conservation of the mullioned window. You reach the courtyard through the arch. On the right hand wall you can see the slits and the arquebusiers, which show that the complex was fortified. To the left are the remains of a cloister brought to light in 1950. The elegant palace with the typically Sienese mullioned windows was the summer home for bishops. Below the courtyard floor precious mosaics have been discovered that date back to the Roman Empire and which belonged to a large Roman villa furnished with hot air heating. Judging from the size of the "greca" design that is the frame of the floor, we can imagine that the mosaics proceed under the level of the floor of the church for quite an area. The entrance of the church is unusual: instead of going up the steps, you go down. 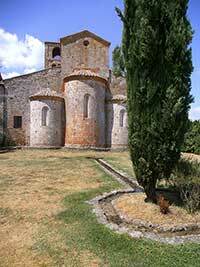 The inside, divided in three naves, reminds us of late French Romanesque, quite near to Gothic. The first span to your right is smaller than the others because it includes the preexisting bell tower. The capitals are elegantly decorated with human figures and geometric forms. The beautiful vault of the strange "tiburio" has a barrel shape, while the lateral ones are "a vela". Monastery of the Pilgrim in Passeno, near Castelmuzio was founded in the 7th century (653-661) by a Longobardian lord named Ursus Ariman, and was located close to an alternate route of the Roman via Francigena. La Pieve di Sant'Appiano si trova nell'omonima località del comune di Barberino Val d'Elsa. La pîeve ècontornato da severi cipressi e si compone della Pieve Romanica, delle rovine di un diruto edificio ottagonale, del chiostro, della canonica e di un gruppo di case lievemente discosto, costituenti il villaggio. Alla bellezza del paesaggio si accompagna la sacralità del luogo, qui infatti, si conservano le spoglie del Santo che ha dato il nome alla località.